Here is a funny story. 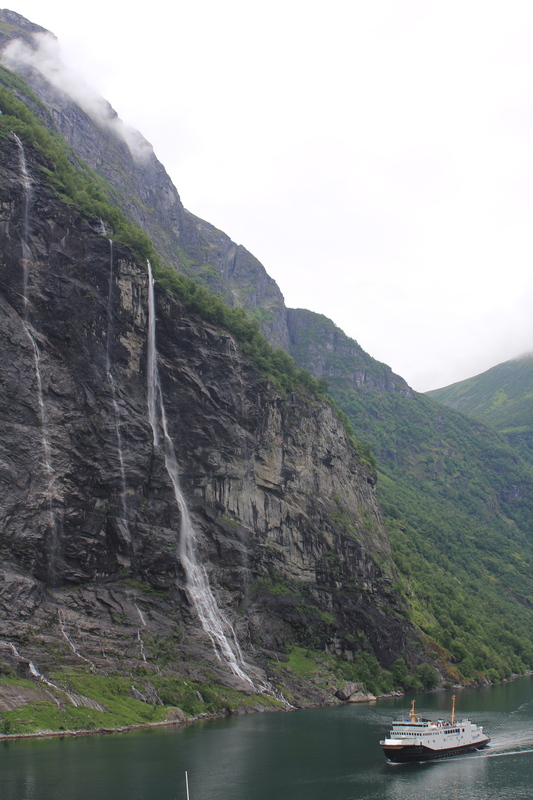 When we were booking our cruise to Iceland to Norway, we did not realize truly what a Fjord was, or that our first stop in Norway would be through one! If we had known before we did our research after we booked our cruise, we would have been super excited about going there. 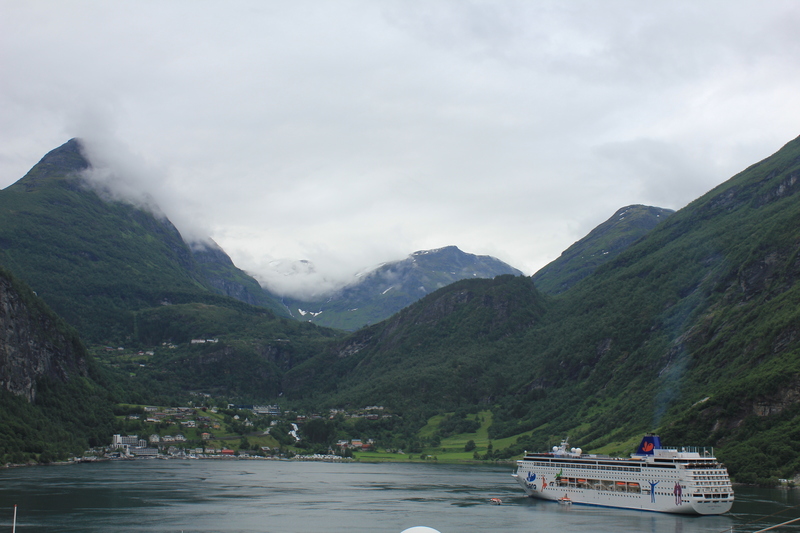 We were not scheduled to come in the port town of Geiranger until 8am. Since it was almost a 10 mile journey from the Atlantic Ocean into the Fjord, I set my alarm and got out at 6am to start taking pictures as we entered the Fjord. 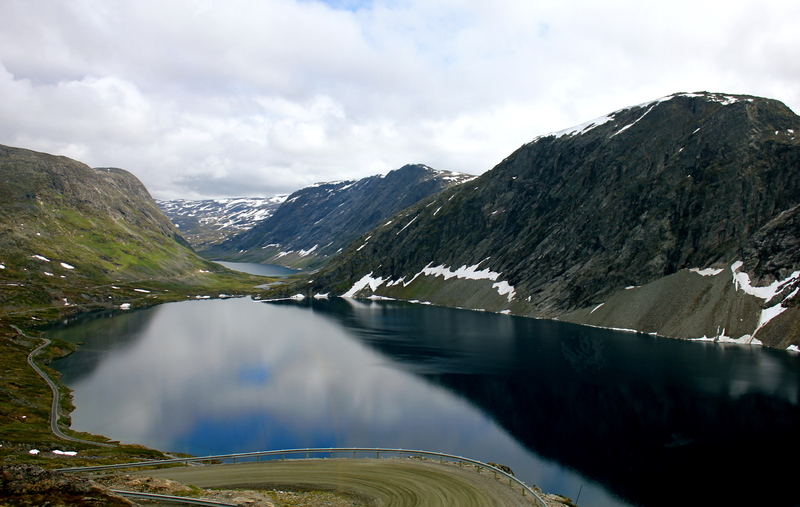 A Fjord is created as the glaciers retreated from the sea cutting huge deep pathways between mountains that filled up with water from the sea. The pictures do not do justice to the true site. Imagine you are on calm sea water with 1000 foot mountains on either side of you. The path is probably large enough to fit two ships side-by-side. 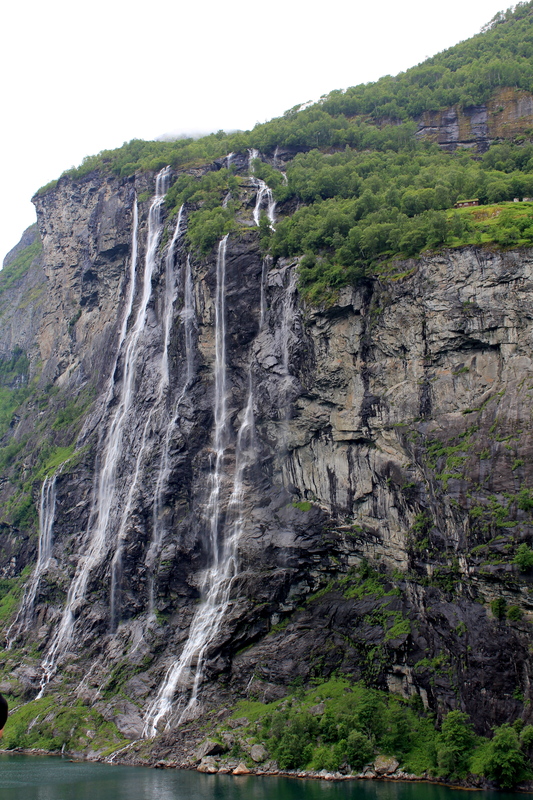 And, along the way are dozens of waterfalls from the snow that melts during the summer. I can only imagine what the waterfalls were like a couple of months before as most of the snow had melted. 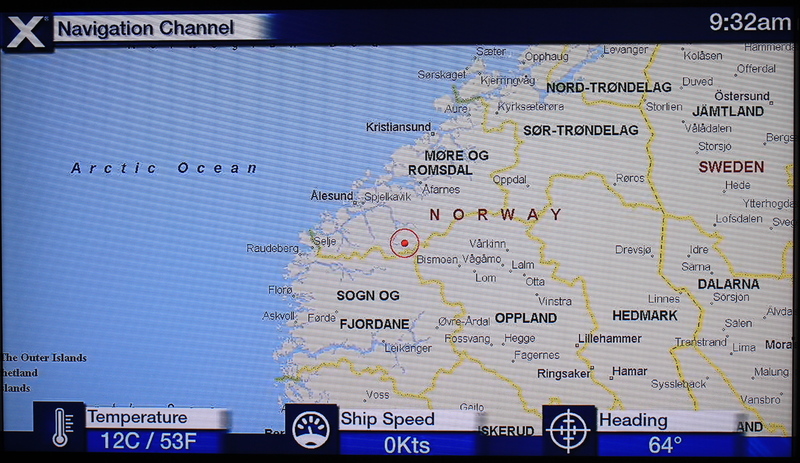 This shows our position inland, and how far our ship had traveled. My favorite spot on a cruise ship is the rear of the boat. 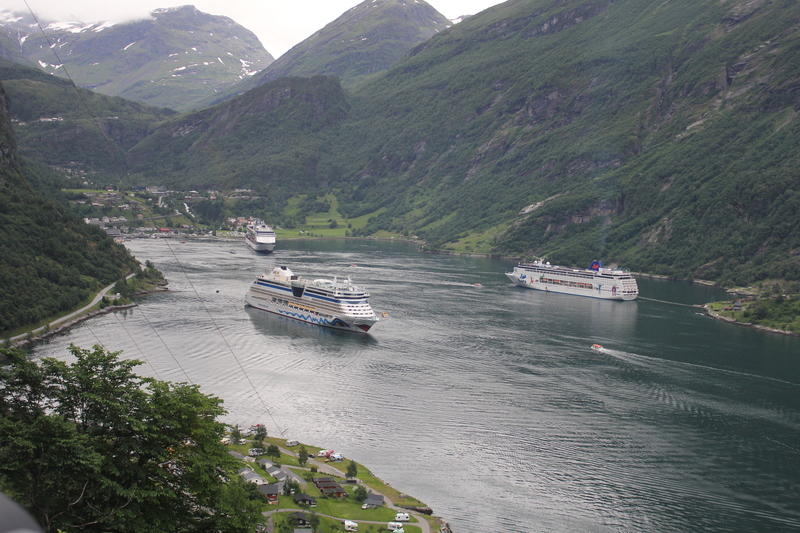 The trail of the ship is interesting to see, and here we are just entering the fjord. The winding road our bus had to travel. 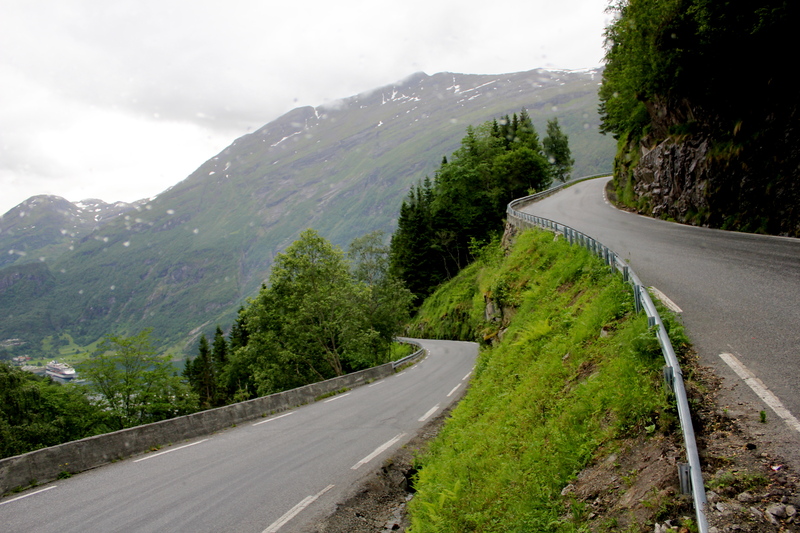 During the summertime, like we were in, the roads can get extremely busy. 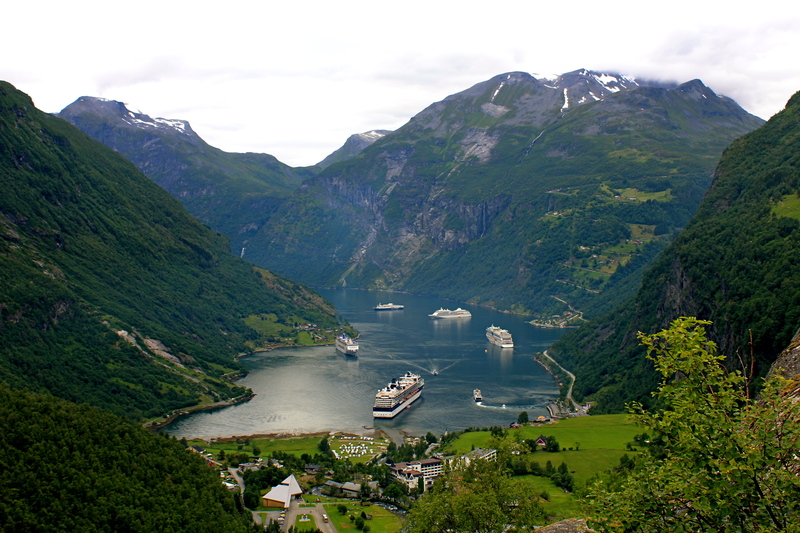 Our ship had to tender her in the bay of the town of Geiranger. 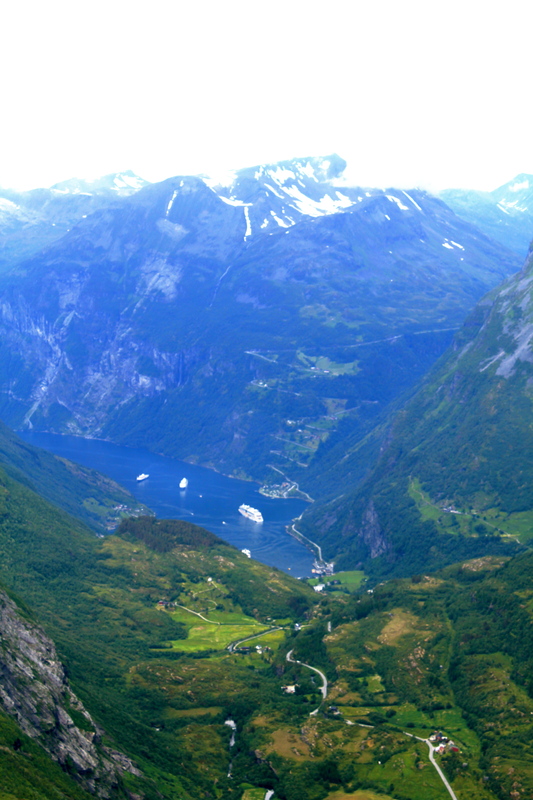 Our excursion for this trip was a bus ride, up 15,000 feet to the top of the fjord into the clouds! These were all of the cruise ships that are visiting for the day. Ours is the large one in the front center. 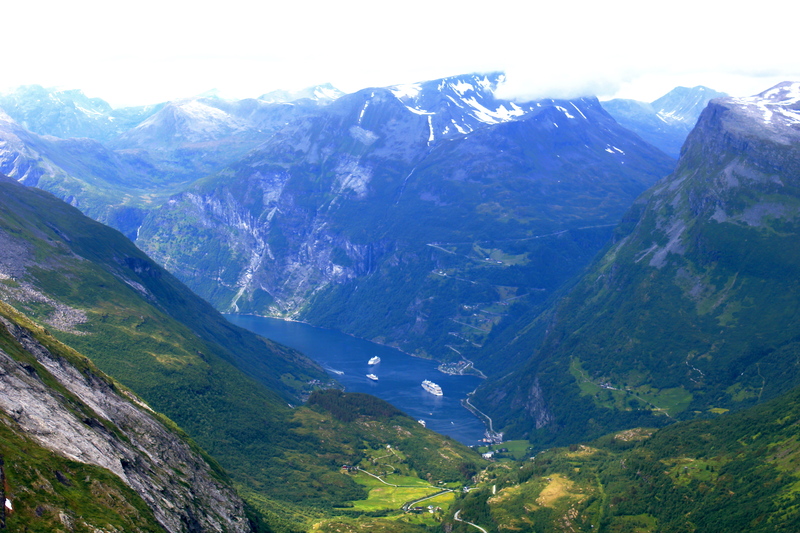 An incredible sight halfway up (7,000 feet) was this fjord on top of the large fjord. The lake here flowed down to the smaller lake in the distance that flowed as a waterfall down to our ship. Amazing. 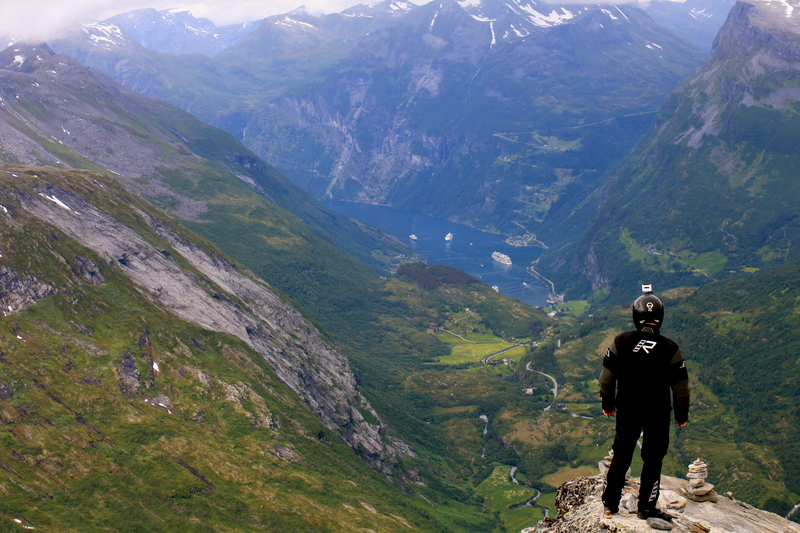 Okay, we just made it to the top, and now I am ready to jump off!!! Our next stop in Norway the next day was to the commercial town of Bergen. 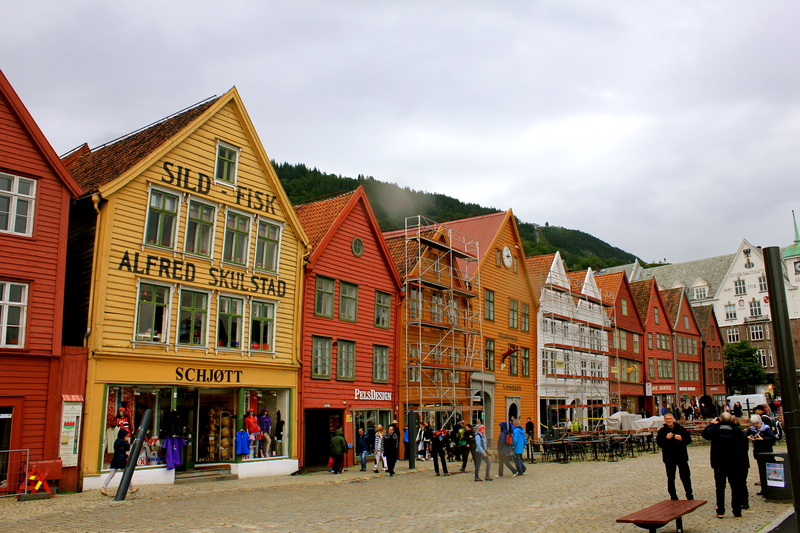 Bergen is at the southwestern end of Norway, and grew as a city where fish, fur, and animal trading occurred hundreds of years ago. This was our last stop for our cruise, and was the worst as far as weather goes with the rain. 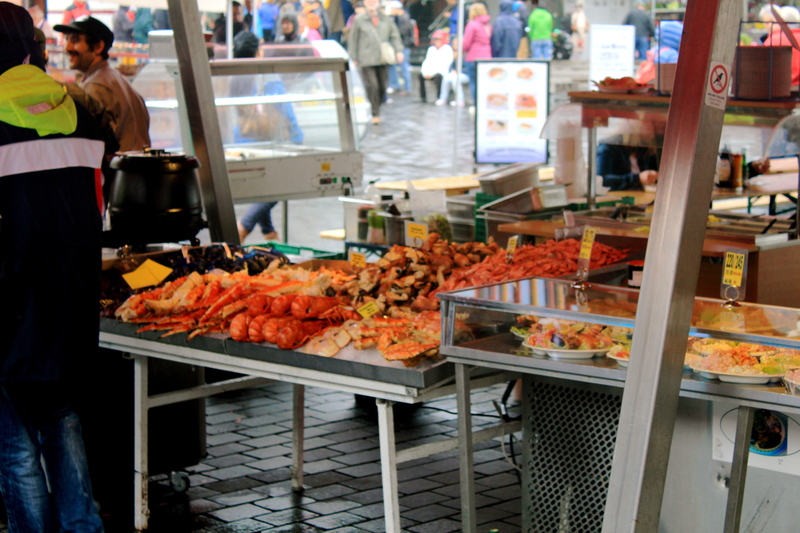 So, we did not take a lot of pictures as a result, but we were able to go and walk about the city, do a little shopping, and eat a very nice (BUT EXPENSIVE) fish lunch. My fish sanwhich cost the equivalent of $15…but, it was sooo good!! Absolutely loved the color of these row homes that were once merchant and trading buildings…now, a different kind of trading is done, as they were all basically tourist shops. 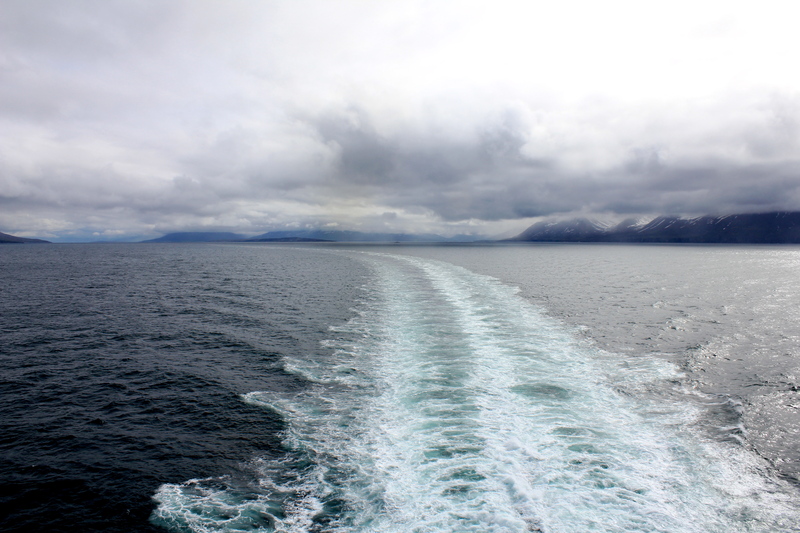 Previous: Previous post: Travel to Iceland & the Arctic Circle. Does the sun ever set? Next: Next post: How to Obtain a German Drivers License? Study, Study, and Oh Yeah — Study!